Beginning with the story of Creation, the Bible teaches us to use and respect the land, conserve natural resources, and save energy. 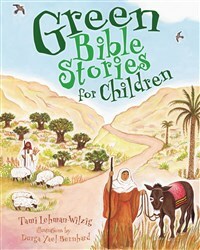 The Bible stories of Noah, Abraham, Joshua and others are retold, and reinforced with activities that will help young readers understand how to nurture and protect the environment. An environmental theme unites nine Jewish bible stories enhanced with a variety of science and nature activities. "The religiously focused narrative begins by stating that God’s 'perfectly planned planet' has been misused by humankind. Biblical figures such as Noah, Abraham, Joshua, Joseph and Moses demonstrate how the Bible is filled with ways to preserve and respect the earth. From Noah’s Ark and the flood, illustrating the beauty of the planet’s biodiversity, to Joshua’s need for sunlight to successfully defend the people of Gibeon with solar power, each scene is connected to a contemporary interpretation through introductory paragraphs and child-oriented projects. For example, noise pollution is addressed through the story of how Joshua destroyed Jericho first by surrounding the city walls with silence and then by using the loud trumpet blasts to crack the ramparts reinforcing the walls. This is followed by a simple science experiment that will observe whether two identical plants will grow differently under soothing classical and loud hard rock music. Biblical scenes done in gouache against white or pastel backgrounds alternate with easy-to-achieve directives in white panels set against a background that look like green handmade paper. A final 'potpourri' section deals with biblical laws and practices for a plethora of eco-friendly practices." Born in the United States, Tami Lehman-Wilzig now lives in Israel. She has a Bachelor’s Degree in English Literature and an M.A. in Communications from Boston University. She is one of Israel's leading English language copywriters. Her children's books include Tasty Bible Stories, Keeping the Promise, Passover Around the World, Hanukkah Around the World and Zvuvi’s Israel. She lives in Kfar Saba, Israel.